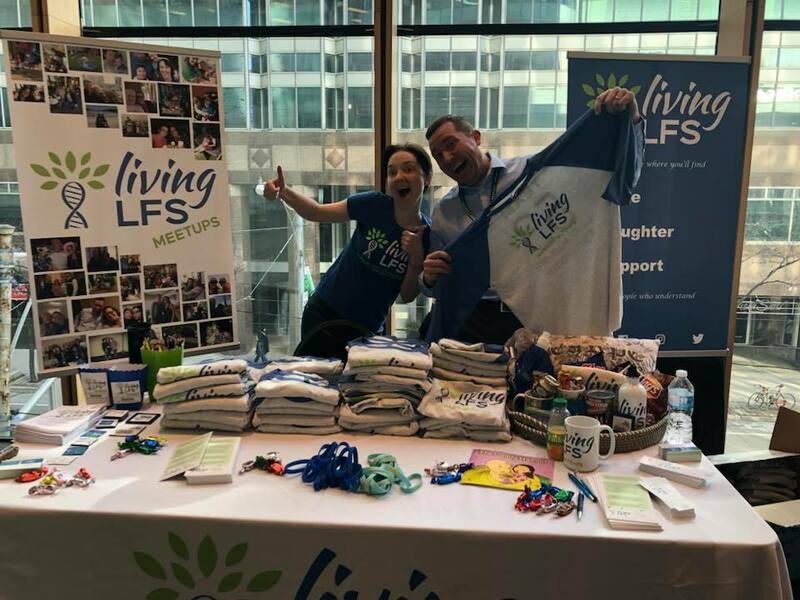 Living LFS was fortunate to attend the Li-Fraumeni Syndrome Association’s REACH 18 International Symposium in Toronto, Canada from April 25-29. 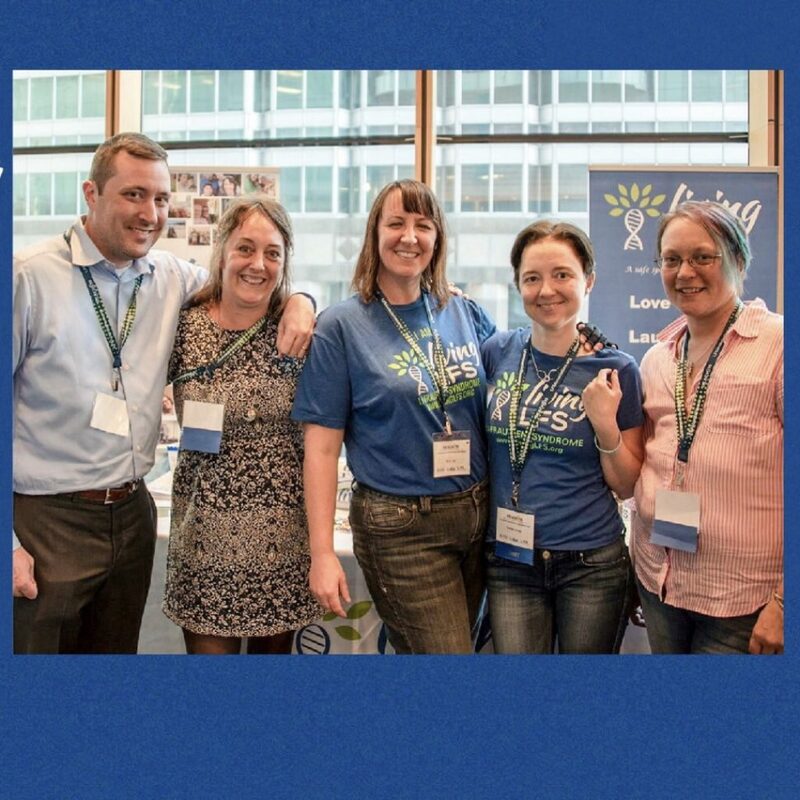 Board members and support group members gathered at the Living LFS exhibition table, generously provided by the LFSA, between presentations by over 30 of the world’s foremost physicians and scientists in the fields of cancer genetics and LFS research. Greg and Fannie manning the Living LFS Table. 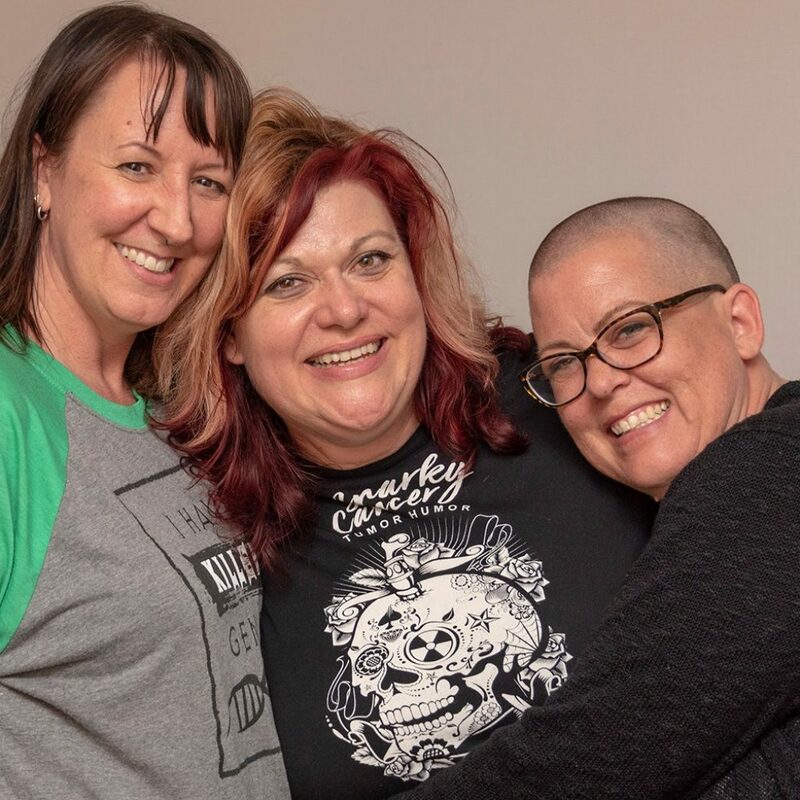 So many thanks to Snarky Cancer for creating the Team TP53 t-shirts! It’s appropriate since they often say with LFS and other rare diseases, when you hear hoofbeats, think zebras not horses. Hosted by the LFSA, LiFE Consortium and The Hospital for Sick Children, hundreds of people who are living LFS gathered to share knowledge and stories. You don’t have to have LFS to be a part of living LFS. When we love someone with LFS, we all live LFS and count on support from family, friends, clinicians, and researchers. 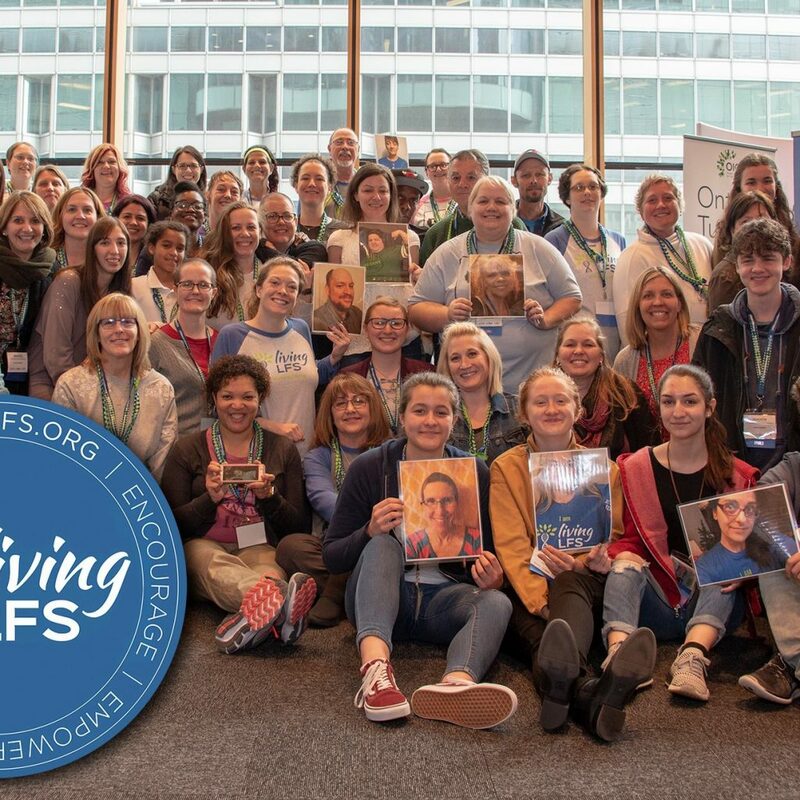 Through Living LFS T-shirt fundraisers and the Friends of Living LFS travel scholarship program, we provided 14 travel scholarships to help group members attend the conference. Here’s what some of these friends gained by attending. 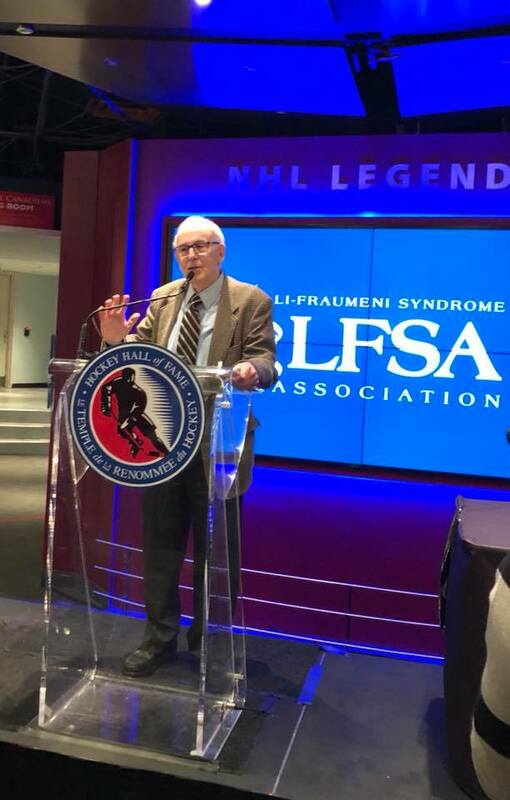 Dr. Joseph Fraumeni speaking at the Hockey Hall of Fame. It was truly an unforgettable night that the LFSA put together! Nicole- I’m sure that you all have heard enough of me lately but I just want to express my gratitude for the LFSA for putting on the 2018 symposium! 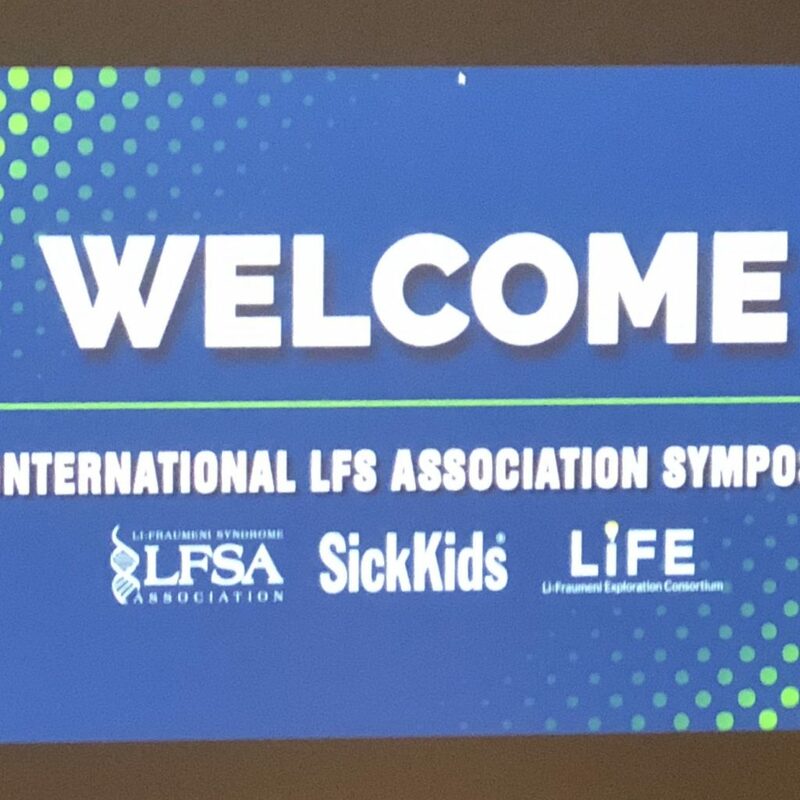 I was able to travel to Toronto Canada last week for a conference all about the disease I have called Li Fraumeni Syndrome, the LFSA brought together over 250 Doctors, and geneticists that specialize in LFS! There were also over 50 people from all over the world who all live with LFS like me! Not only did I learn more about my disease but I was also blessed to meet the Doctor who discovered my disease, Doctor Joseph Fraumeni, it was almost like being in a room with your greatest hero, but more amazing! I met so many men and women that I hope to only get more acquainted with, all you LFS mutants are always on my mind and in my deepest thoughts! Katrina- How do I even begin to explain what this week has meant to me. I can’t. I have Li-Fraumeni Syndrome(LFS) and genetic mutation that caused me to have cancer twice and the likelyhood of having a second primary cancer is a shocking 57% and a third 38%. It is completely out of my control. It was an honor to meet with the doctors and specialists that are leading the latest research on LFS. It was incredible to see the possibilities. Hope. I have struggled with knowing how to move forward other than putting my head down and doing. This reality has been something most people can’t grasp. I have known so many incredible people who understand my struggle who until this week I had never met for realz. It was incredible to meet them, finally. You know who you are. You are my friends and LFS family. You understand my reality, my fear. The loss of your old self, your body and your innocence. You understand what life is about. How to not sweat the small stuff. You show no judgement. You love hard, laugh hard and live hard. You know loss, so much loss. I was not sure what I was going to find on this trip to Toronto, but I knew I had to go. What I found was love. Thank you to all my Living LFS family for being you, my tribe. Illonka- The past week has meant a lot to me, even more than I had expected in advance. I can barely find the right words to cover the past few days. It was overwhelming. Grateful that I could be there, also partly made possible by the Living LFS organization. This 4th International Li-Fraumeni (LFS) Symposium in Toronto, Ontario, Canada was right in between my last chemo round and the big operation planned in a week and a half from now. I have LFS, a mutation in the TP53 gene. Elephants have a 5% chance of dying from cancer in their lives compared with 11 – 25% in humans. It appears that elephants have much more P53 copies in their genes. Patients with LFS have 1 normally working P53 gene, healthy people 2, African elephants at least 40. What is LFS in ordinary people language? In comparison with ‘ordinary’ healthy people, I only have one knight in my body who can fight against possibly arising cancer cells instead of 2 knights. There are many different TP53 mutation types. People with this mutation therefore have a greater risk of developing cancer. I am, as they call it, ‘de Novo’, or the starter. Making me the only ‘mutant’ in my family. There are many different gradations in LFS. Women with LFS have 90% chance of developing cancer, and that high percentage is due to breast cancer. LFS and breast cancer are just a dream wedding. Which explains why I’m batteling my 3rd breastcancer at the moment.It was an honor to attend the lectures on the latest research developments on LFS, and to be able to ask questions to the medical community. 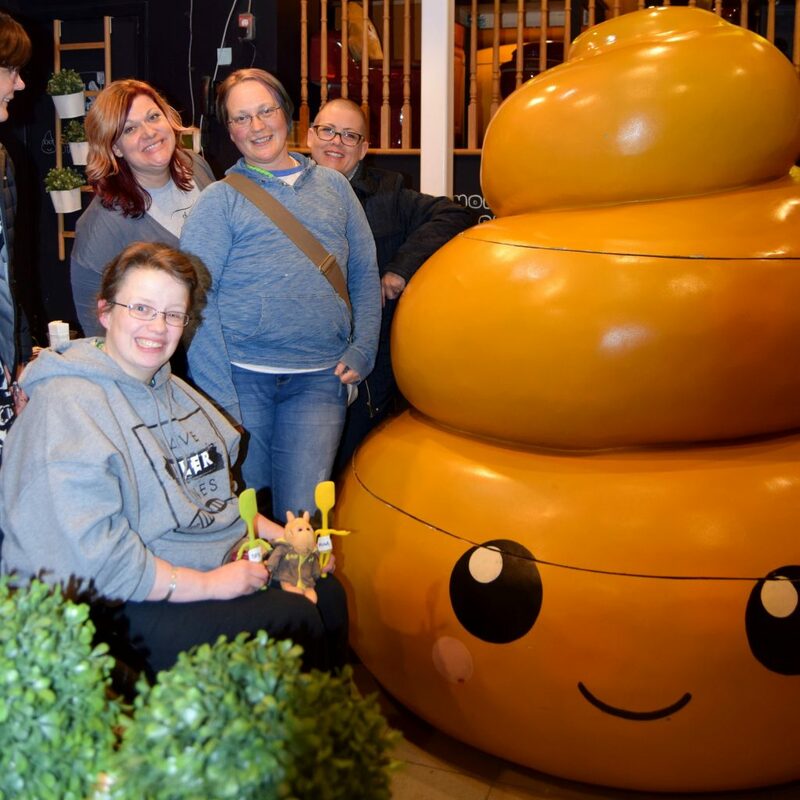 The online Living LFS support group is amazing, but until this week I had never met anyone who has the same mutation as I do, except for Kaj *. Living with LFS, living with cancer, and living with cancer lurking around the corner constantly is lonely. Many people can listen to you, try to be there for you and support you, but to realy fully understand is a very difficult task. The scans, the fears, the treatments, the loss, and the pain. I have met so many brave people in these past days who fully understand my struggle. It was incredible to be able to finally meet some of them. The lovely conversations, the fun and the tears we shared. My LFS family, my friends, my tribe. I feel grateful and hopeful. Thank you! Team Living LFS- as many friends as we could wrangle for a picture- there were so many more- researchers, doctors, all who support us in this crazy LFS life! Monica- I’m laying here knowing it’s my last night. MY heart is so blessed and yet so heavy. I want each of you to know how amazing you are and all such beautiful souls. Thank you for the scholarship to help make this happen. Thank you Fannie for the lodging idea. Greg thank you for the encouragement. Jeffrey, thank you for being the taxi cab and for just being amazing. Thank you to the rest for taking me in and treating me like a normal mutant!!!  I miss my family at home but my heart hurts leaving my LFS family. It was so nice being with people that understands how my body feels. I am also blessed that no one at home knows Prayers always and lots of love!!! Anonymous  – I was inspired to see the willingness amongst researchers, scientists, and professionals alike come together for the same goal, LFS. Much of the data was overwhelming, I felt a sense of sadness yet comfort seeing the LFS families come together for support. Erin- Attending the conference and meeting others who could relate to things that I have gone through, was a blessing. In my family, just about everyone who has been tested or had cancer, have all passed. I had no other women with LFS that could relate to my situation or even just talk to. Just to have the opportunity to connect with others with similar situations was a blessing. I’m so thankful for the scholarship for allowing me to make it this year. Lisanne- So thankful for the scholarship to be able to attend to the symposium. Thank you so much Living LFS. Wow, how can I capture the last few days. Meeting so many other families with the same gene mutation. Listening to the latest research on Li Fraumeni. Had really good meetings with the Swedish representatives. Jenny- The conference was an eye opening experience for me!! I was positively overwhelmed by the number of doctors, scientists, and genetic counselors that were there from all over the world, solely dedicated to saving my life, studying and researching the gene that has affected me and my family my whole life. Basically I thought, “All of these people are here for me?” My favorite part by all means, was the coming together of LFS families and friends who share one unique mutation and many familiar life situations, very tough situations. Being in a room full of people that understand you and love you without judgement is a life changing experience. For once I didn’t feel alone or out of place. 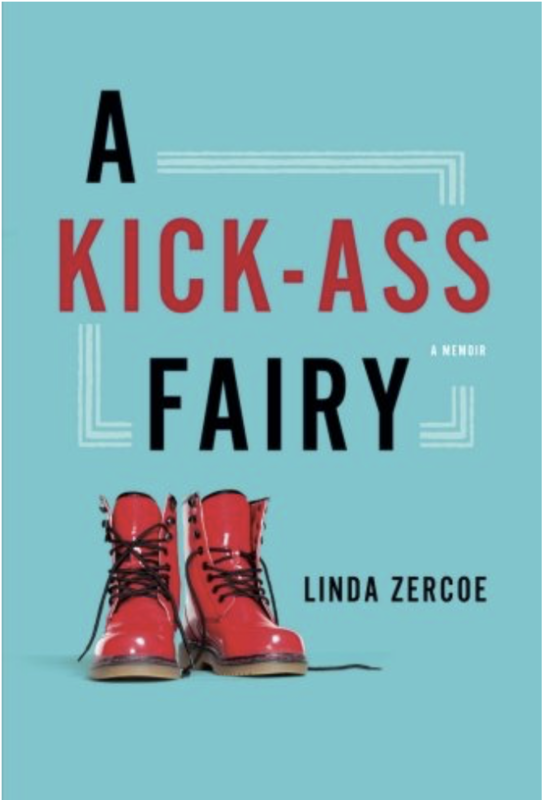 Andi – LFS can be isolating in everyday life. Being able to spend time in Toronto with so many people who understand and accept each other without explanation was an overwhelming experience – hearing stories similar to your own, knowing the same fears and anxieties, feeling the same huge hopes. For a first timer like me, these were surprising comforts. Trish said, “Support organizations are a vital part of cancer treatment. We treat the spirit.” I had no idea how true this was until the Toronto event. I am so grateful to Living LFS for creating the community so many of us need, and for making it possible for us to spend time with together, both online and in person. Living LFS’s Andi, Trish and Jen- all smiles to be together! The BEST part of conferences!